If you have a home theater, a nice addition will be whole house audio. Whole house audio allows you to enjoy music in any room of your house and outdoors. 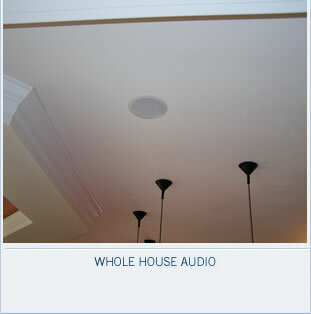 Whole house audio uses most of the existing Surround Sound equipment to play music in one or more rooms. The one additional component which will be needed is an amplifier. This allows you to say, listen to holiday music in the kitchen while the ball game is playing in the family room. Choices of whole house audio equipment will depend on the number of rooms in which you would like to have music. A. 1-3 rooms each with volume controls and 2 speakers. Each room controls volume independently, but all rooms listen to same source. B. 3-4 rooms each with keypad control and 2 speakers. Each room can control volume, sound source selection, but again all rooms listening to same source. C. Up to 6 rooms. Each room has keypad control for volume, sound source, and each room can listen to different source. For any level of whole house audio, only 1 amplifier is needed and EE will make this selection with you. Then for each room a volume control or keypad is needed along with a pair of speakers. Any of the speakers in the Surround Sound can be chosen, but generally in-wall or in-ceiling speakers work best.